On-Site Medical Services | Maryland Medical First P.A. Maryland Medical First is located at 8901 Clement Avenue in Parkville, Maryland, right off the beltway. MedStar Good Samaritan Hospital is approximately 10 minutes away. Our facility is equipped with the latest technology and medical equipment to perform many procedures and diagnostic tests on the premises. Many other treatments and procedures can be performed nearby at the hospital, and we follow our patients to manage their care from there. We never lose touch with our patients, no matter where they are being treated. 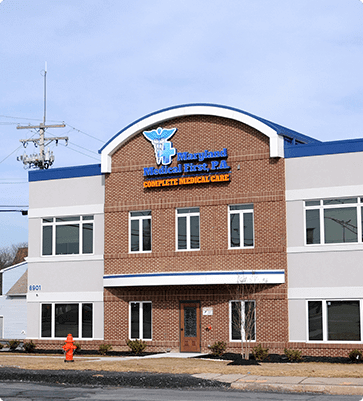 If you’ve been seen by one of our team physicians, nurse practitioners, or physician assistants, you will eventually make your way back to our main office at Maryland Medical First P.A. outpatient clinic for follow-up care. To make an appointment, please call (410) 661-4670 or request an appointment online now.